We absolutely believe that Security and Tactical services should be able to respond to emergency situations knowing that they have the best chance of surviving. Celox products are designed for the tough demands of tactical medicine; elite services select Celox products for their trauma kits based on rigorous laboratory testing and proven performance in the field. Celox Rapid Gauze stops bleeding from life-threatening injuries with minimal treatment time, while Foxseal adds the ability to seal penetrating chest injuries, both fit in a compact individual first aid kit (IFAK). The fastest acting hemostatic gauze. The fastest acting hemostatic gauze, that stops severe arterial bleeding with only 60 seconds compression. 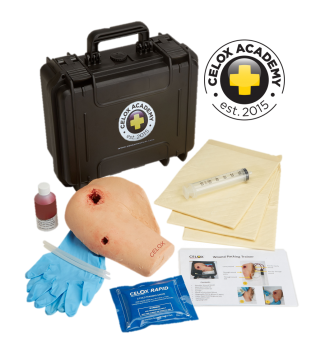 Celox Academy wound training kits are made using high grade materials that simulate human skin and tissue. 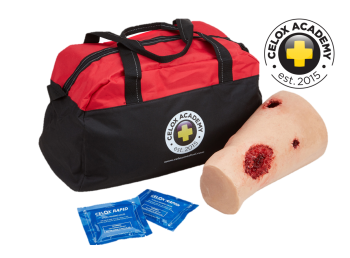 Each training kit comes complete with simulated injuries that can be used to train with Celox Granules, Celox Applicators and Celox Rapid and Gauze products. Perfect your skills. Practicing packing technique. The fastest acting compact hemostatic gauze ribbon. Celox Rapid Ribbon brings all the benefits of Celox Rapid Gauze in a 1 inch strip. Treat narrow entry injuries fast with the power of Celox Granules in a pre-filled applicator. Celox™ Granules can stop severe bleeding fast. The dependable chest seal in a compact pack. 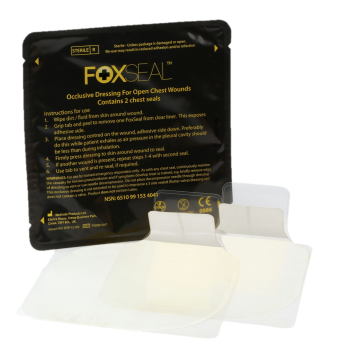 Foxseal Chest Seal is a pioneering occlusive dressing for the treatment of open chest wounds as a tool in prevention of pneumothorax.